120 Runnymead Avenue, Chartwell, South Africa. What is the price of the Hippo Roller? The price of the Hippo Roller is $125.00. Hippo Water Rollers are manufactured using a very specialised process (roto-moulding) – it takes one hour to make one unit. The average lifespan is 5-7 years, and often more. If worked on an average of one roller shared by at least two households, 7 members per household, lasting 5 years, it equates to less than $2 per person per year. The drum of the Hippo Roller is made from UV stabilized linear low-density polyethylene. LDPE is one of the safest and most eco-friendly plastics; it is easy to produce without the toxins involved in PVC or Polycarbonate. These plastics are found in bread bags, fresh produce bags, milk cartons, hot and cold beverage cups to name a few. LDPE is considered a low hazard plastic. This is a huge improvement on makeshift water carriers that are normally used which include old chemical drums, paint tins etc. The newly designed Utility Cap allows users to conveniently and hygienically draw water and ensures hygienic storage of clean water. Clean portable water is achieved by fitting a filter onto the Utility Cap. Although the plastic drums and caps could be recycled, we have found that beneficiaries are not willing to return damaged rollers but would rather re-purpose them as storage bins, plant pots, and when cut vertically in half can as feeding and water troughs for animals and even baths for washing clothes and children. We only use virgin material since we want the maximum lifespan for the Hippo roller as it is generally funded with donor and sponsor funds. It is in fact also very difficult to source recycled material. The Hippo Water Roller is specifically manufactured to be very durable and for this reason does not easily break or land up on the scrap heap. How durable is it in rough, rural terrain? The Hippo Roller is specifically designed to be completely maintenance free and highly durable, even in tough rural conditions which include uneven gravel surfaces, sharp stones, footpaths and even hilly terrain. The resulting stresses are diffused around the entire drum which has no joints and flexible properties – it picks up and embed sand granules which adds an extra layer of protection. The wall is thick enough to prevent punctures, giving it a 5 to 7 year life span, often much longer. Extensive tests over the last 25 years and various awards have proven the Hippo Roller to be effective and durable. 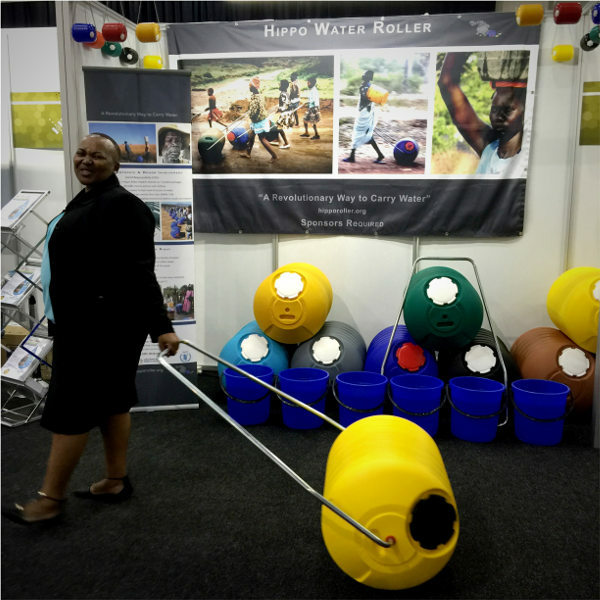 The main focus of Hippo Rollers is to improve access to water. It is a flexible infrastructure, and many water purification options can be added to decontaminate the water. We are now partnering with a solar-based chlorine-producing system which can be installed on-site in the community to generate chlorine to disinfect drinking water. Our mission is to provide Hippo Rollers with this system as a complete solution for each community. Clean water can also be achieved by fitting a filter onto the Utility Cap. Isn't it too heavy when filled with water? The innovative design of the Hippo Roller means that the majority of the weight is dispersed on the ground. A full drum of 90l (24gal) has a weight of approximately 90kg, but the effective weight when pushing the Hippo Roller filled to capacity is only 10kg. Far less effort is required to push the Hippo Roller than to carry 20 litres of water on your head in the traditional manner.